Claire Ritter, Ran Blake (pianos), Kent O’Doherty (tenor sax). A concert by pianist, composer, educator Claire Ritter, recorded live at Queens University of Charlotte, North Carolina, given to honour Thelonious Monk’s centennial. 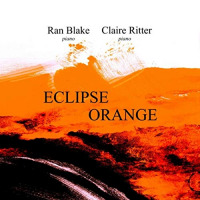 Twenty short tracks – in nine, Ritter is joined by her mentor Ran Blake in two-piano duets and, in five, by Australian tenor saxophonist Kent O’ Doherty. The pianists also have solo outings – five for Blake and one for Ritter - making for a special album of delightful miniatures (six of which are just one & a half minutes long) played before an appreciative, receptive audience, where the players show mutual respect for, and enjoyment of, each other’s abilities. Two pieces by Thelonious Monk - Blue Monk and I Mean You, three from the GASbook - Over The Rainbow, There’s Been A Change, Summertime, a Jobim/Barrosa medley, with the remainder being original compositions from both pianists some of which are contrafacts based on chord-sequences I recognise but can’t identify! Highlights for me are Blake’s fascinating, oblique re-harmonisation of the well-known bossa-novas in the Brazil Medley, the humorous, swinging 2-pianos on Blue Monk, Claire’s graceful, flowing solo spots on Emerald and the Breeze and Karma Waltz and Claire & Kent’s duets on High Top Sneakers and Cool Digs. The whole CD is full of beguiling music played with imagination, empathy, wit and humour throughout and I would recommend it thoroughly. It will be available from February 15 on Zoning Recordings ZR1013 from iTunes, CD Baby, Amazon, Spotify and international streaming Zoning Recordings (ZR1013). Wigan Early Bird about to fly! CD Review: Duncan Eagles - Citizen. CD Review: Howard McCrary - Moments Like This. River City Ride Again - as a quartet! Hey, wanna buy a guitar? Jam Session @ the Black Swan - January 8. Hear Me Talkin To Ya!